Ambiance Blue is a pack that includes GTK2, GTK3, GNOME Shell and Avant Window Navigator themes, especially designed for those who like the Ambiance theme style but don't like the orange or simply want to try a fresh style while keeping the overall Ambiance look. 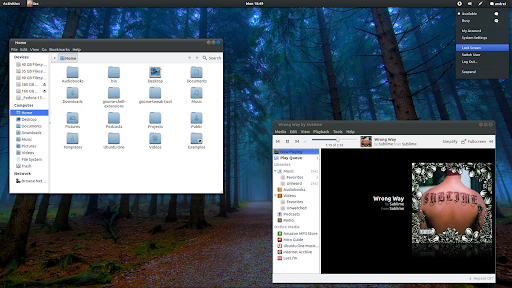 Since the pack comes with both GTK2 and GTK3 themes, you can use Ambiance Blue in both GNOME 2 (Ubuntu 11.04 or older) as well as GNOME 3 (Ubuntu 11.10) - or other Linux distributions, but for the GTK3 theme you'll need to install Unico GTK3 engine. As you can see, Ambiance Blue window titlebar works just fine under GNOME Shell in Ubuntu 11.10 Oneiric Ocelot as opposed to the original Ambiance theme which at least for me, reverts to some odd-looking ancient fallback theme (but that will probably be fixed soon). To install Ambiance Blue in Ubuntu (any version), download it, extract the archive, then extract "ambiance_blue.tar.gz" and copy the "Ambiance Blue" folder to the ~/.themes directory (if it doesn't exist, create it). Then use GNOME Tweak Tool to change the theme (it's available in the Ubuntu 11.10 repositories) for the GTK3/Gnome Shell theme or the usual Appearance Preferences for the GTK2 theme. For old Ubuntu versions and other Linux distributions, the Ambiance Blue DeviantArt page provides exact installation instructions (you'll need the latest Murrine and Unico, depending on which version of the theme you want to use). Thanks to Satyajit for the tip!